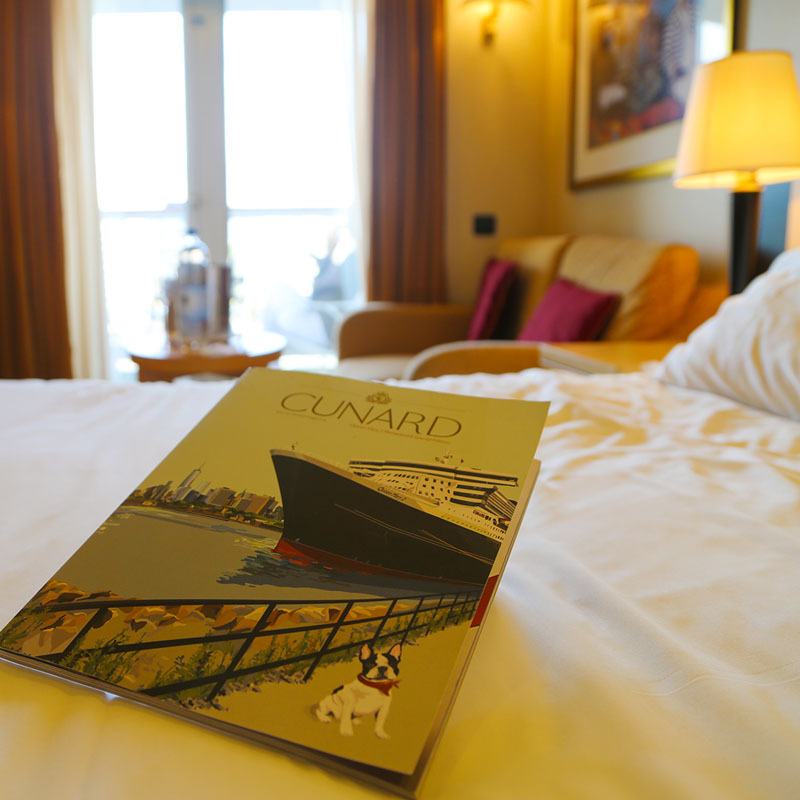 A year ago a too-good-to-be-true cruise deal came up and with very good friends having already bought their tickets, we got excited and took the plunge -15 nights aboard Cunard’s Queen Elizabeth, no less. So here we were, 12 months later, sailing out of spectacular Sydney harbour. The band was playing, the Verve Cliquot was flowing, and the pilot boat was pirouetting beside us in a fond farewell at sea – even a rainbow appeared to wish us well. Getting our sea legs was easier for some of our party than it was for me. Quell came in handy on a few occasions, but given we were aboard for 15 nights, 2 or 3 bouts of seasickness wasn’t too much of a nuisance. Regal, with lots of creams, chandeliers and rosewood bannisters is how I would describe the ship’s décor. Think ballrooms, and theatres and croquet, with framed pictures of Her Majesty adorning the passages. Guests are required to adhere to a much higher level of holiday clothing than we were accustomed to, with no thongs, no sarongs (except around the pool), and no ripped jeans. At dinner, men were required to wear dinner jackets on ‘non-formal’ evenings and on formal evenings they were required to wear a tux or suit and tie. It was all dresses and gowns for the women, with a few pants suits on the informal evenings. This was enjoyable for us initially – the dressing up and stepping into a world that felt like yesteryear – but for our party at least, after about the third formal evening, we were relieved when our program for the day stated informal attire for dinner that evening. 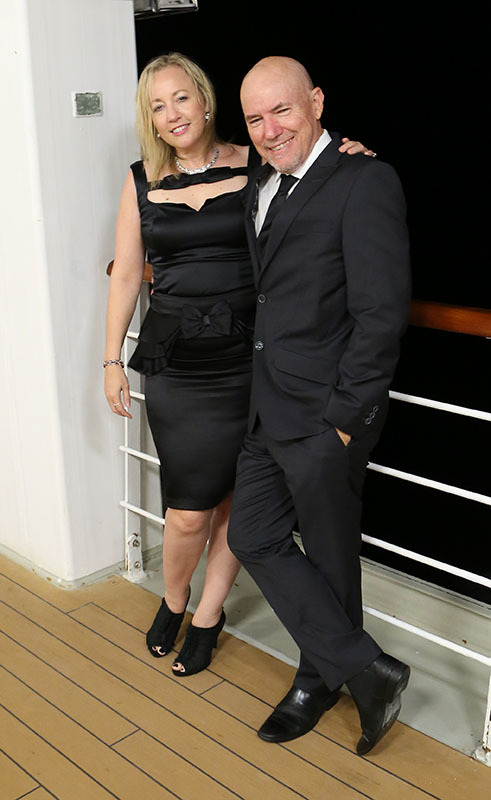 Here are some of the things we loved about our cruise “voy-age”! The food! Was absolutely amazing. Every evening we had a 3, 4 or even 5 course dinner in Britannica Restaurant. Every meal was 5 stars, with service to match. We had the same table for dinner and the same waiter and sommelier every night, which really gave us the feeling of being Kings and Queens with our own wait staff. We had a chance to get to know them and they became part of our experience. Breakfast and lunch were equally lavish and long. Days at sea with no internet or phone connection. Just like days gone by, we found ourselves truly disconnected from the world while we travelled. It was incredibly liberating. Of course, for a fee we could have had all the connection to life back home that we wanted – but we loved the calm that disconnectedness offered us while out on our own at sea. The library, upper deck games, the art talks, and evening shows. Although there was plenty of time to sit and laze on a sunbed, there was also plenty to do each day. This had been my main concern – that I would be frustrated doing nothing – but in reality there was as much or as little to do as you wanted. We tried trivia in the English pub once, and enjoyed that. Other days we went to an art talk, which was very interesting, or exercised in the gym, walked the promenade, played table tennis, swam, or read our books. A truly relaxing holiday. Over 2,000 guests to choose from and we received an invite! 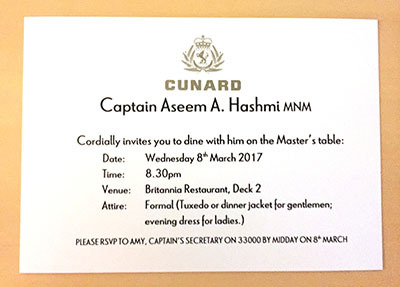 Our surprise invitation to the Captain’s table for dinner one evening. Not quite sure how we swung that one, but we had a fabulous evening meeting new people and chatting with our hilariously funny Captain. A cashless, no credit card holiday. Our room card could be used to purchase anything onboard, including drinks, items from the shops, and credit on the pokie machines. We never had to carry money, and I never had to carry a handbag. I liked this so much that since leaving the Queen Elizabeth I leave my handbag at home as often as I can. Our particular leg of Queen Elizabeth’s world voyage took us to Papua New Guinea for a day stop. We took a cultural tour and a few snaps. The rawness, and natural living of the Papua New Guinea people was a highlight for me. I loved how they lived off the land, and the way they constructed their own social systems. It’s a culture and a place I’d like to visit and spend some time in. Mark, not so much. 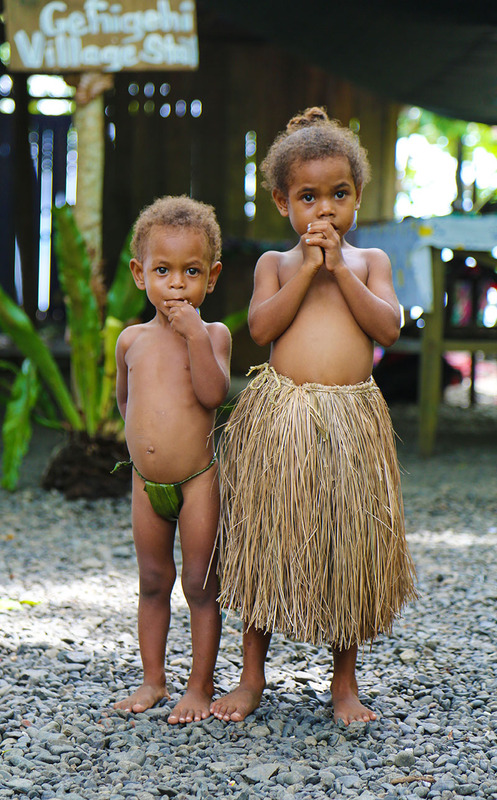 Some local kids in Papua New Guinea – too cute. After Papua New Guinea and some enthusiastic dancing and singing from the locals, we spent 5 straight days at sea. It’s kind of strange when days become so similar in shape. And while I didn’t enjoy the repetition, Mark really found this relaxing and enjoyable. The 5 days eventually ended with us visiting Okinawa, on a rainy day stopover, and then a couple more days at sea took us to our destination of Kobe, Japan where we said a fond farewell to our lovely Queen Elizabeth. Although all food was included in the cost of the ticket, alcohol is extra and adds up quite quickly. On this cruise, prices were in US dollars and a hefty service fee is added to every purchase. A stateroom service fee is added also – which for us was US$300. Just add that into the cost of your ticket when considering purchasing, and you wont be unpleasantly surprised at the end.